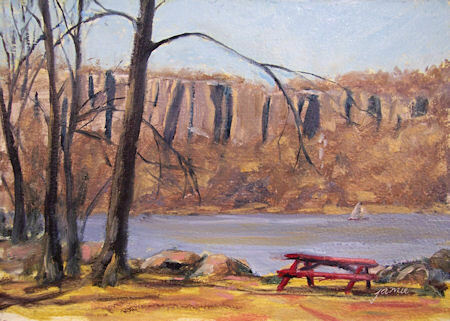 Rockwood is one of my favorite spots along the Hudson. 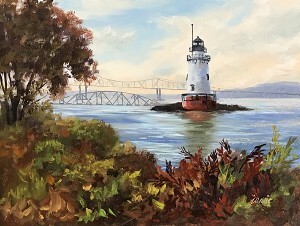 There are views of the Tappan Zee Bridge and the wonderful lighthouse. However, a large residential facility was built along the shoreline in this direction that completely ruins the rural vista. I keep my memory of the way it used to be alive by always painting it that way! 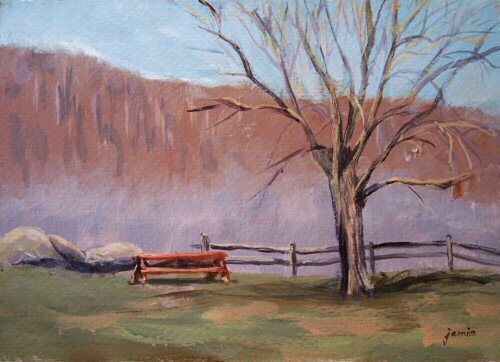 This painting is available for purchase at Adams Fairacre Farm in Newburgh NY. 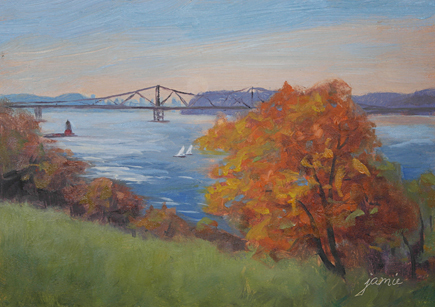 I have 20 paintings on display there as a United Way fundraiser until the end of December. You can see the paintings, help United Way, do some holiday shopping, and buy your fresh produce and groceries all at the same time! 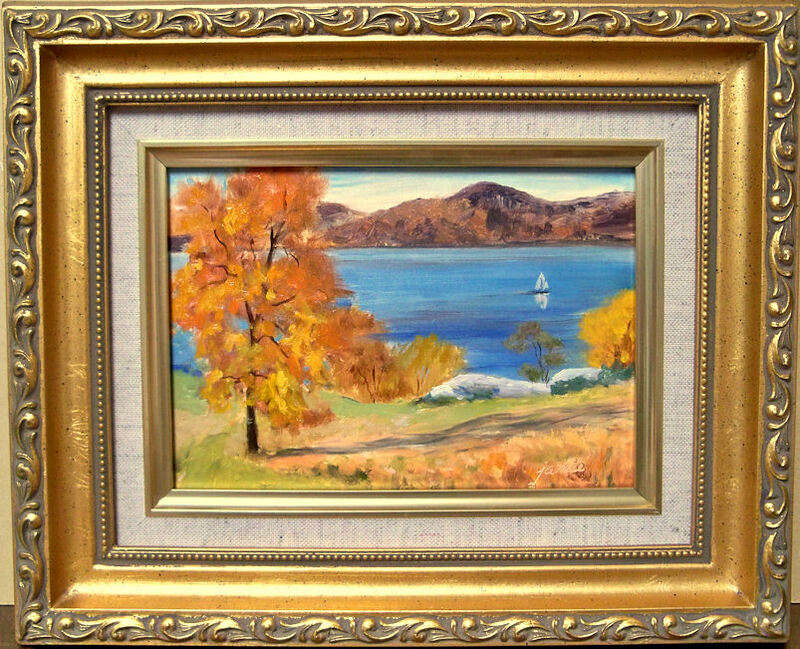 I had a beautiful, gold wood frame for a 3×5″ painting, and decided to do this scene of sailboats out on the Hudson River, below the Palisade Cliffs. 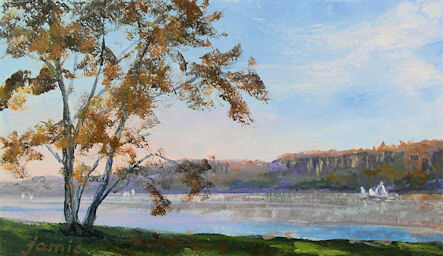 There is a lovely, late day glow above the cliff line past the horizon, and soft fall colors abound in the foreground tree, distant hillside, and water reflections. The image above was taken in daylight, so the color is much cooler. 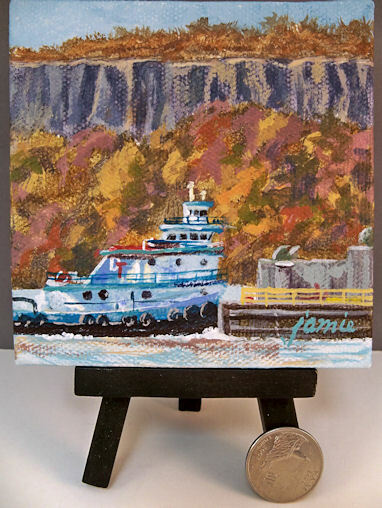 The image below was taken with warmer indoor lighting at night, so you can see how much the color changes depending on the room lighting at the time. It sure does make image adjustment a challenge! 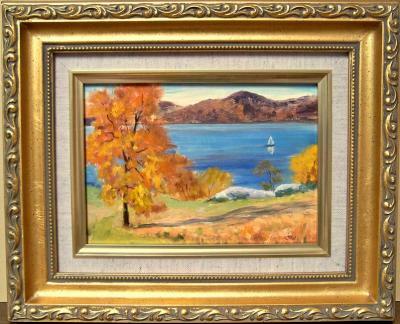 I took a quick cellphone snapshot of the painting in the frame (below), but hopefully you can at least get an idea of how lovely this frame is. 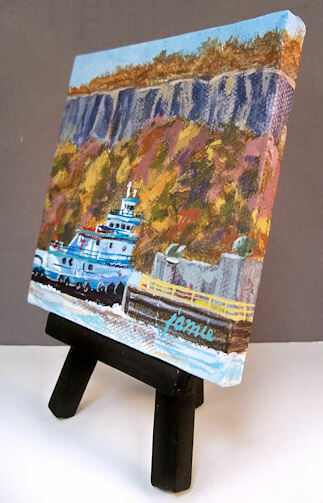 It looks great on a small table easel. I have also included hanging hardware, in case you have a special, small wall space that you want to brighten up. It would make a great Father’s Day gift for that Dad who loves sailing! 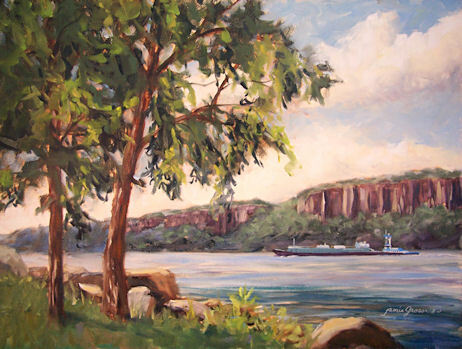 I love painting the Palisades section of the Hudson River. 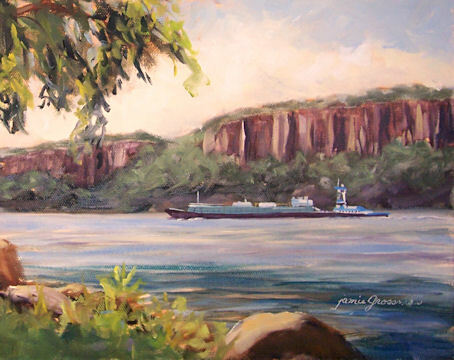 For some reason I can’t quite fathom, this is the first time I’ve painted the cliffs in a panoramic format! I really like the way the 1:2 ratio turned out. 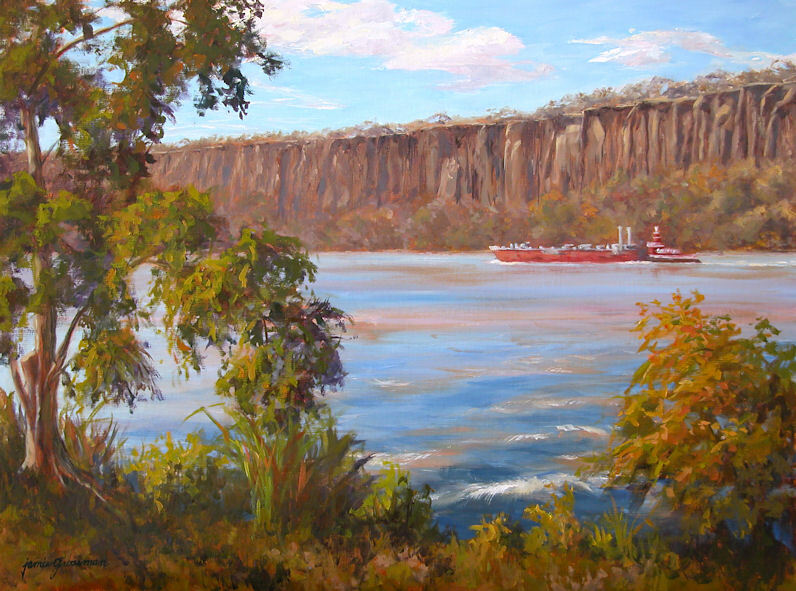 It enabled me to add trees and foliage without obscuring so much of the cliffs. I think that come spring, I need to go back with a larger panel and do another! 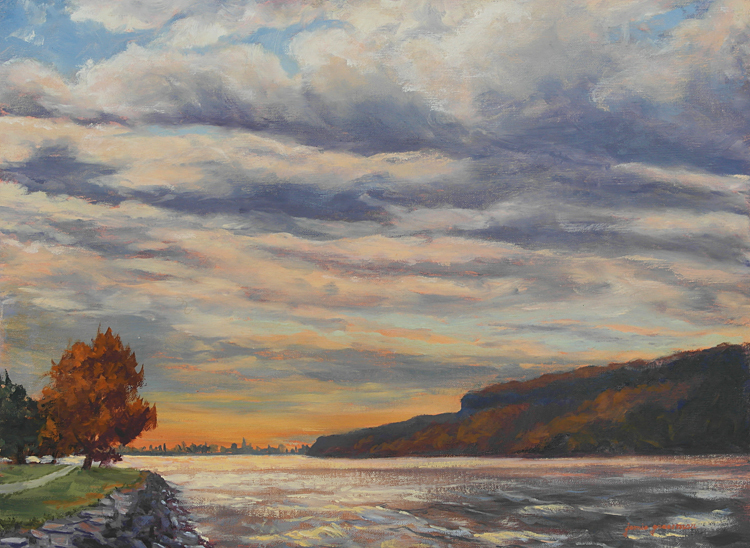 I spent a very chilly morning along the Hudson River last week. I did a lot of sketches and took a ton of photos. It was worth braving the cold! 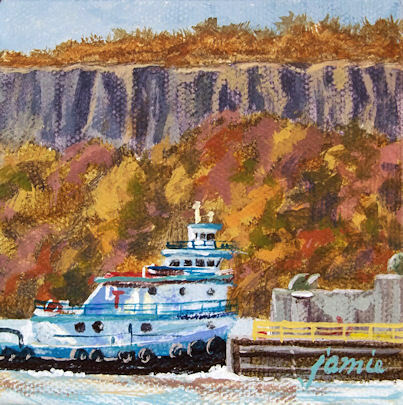 This tug was part of the river traffic that entertained me that morning, with the Palisades looming in the background, and the glistening fall foliage. It’s been so gorgeous out these past few days! 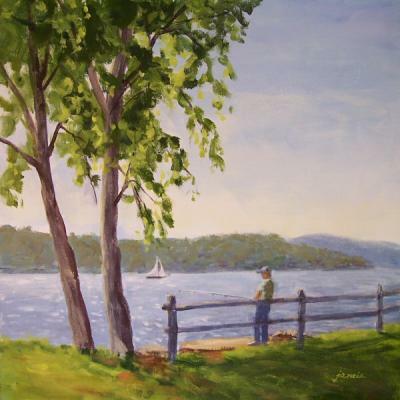 I drove down to Hastings-on-Hudson to paint along the waterfront. 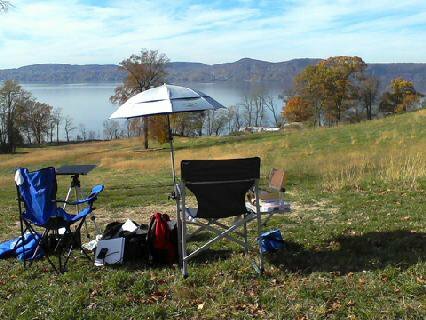 I thought I’d be there painting alone, but three friends decided to join me and we all had a wonderful time enjoying one of these last amazing, warm fall days. Rockwood is such a beautiful place to paint in fall. I don’t get down here often, so I try to make the most of it when I can! 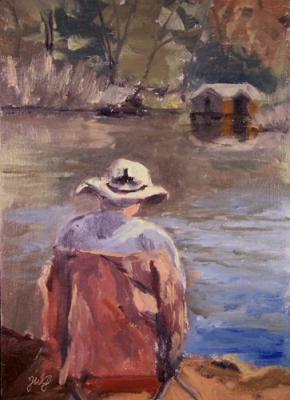 Often the boats that go by are too far out to show a reflection, or the water is too rough to see it. 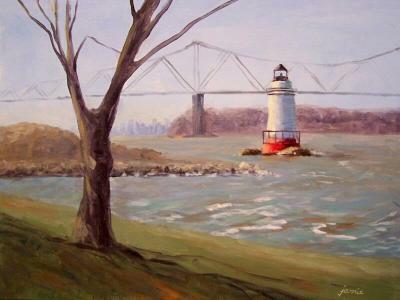 But this one cast a shimmering image on the water. 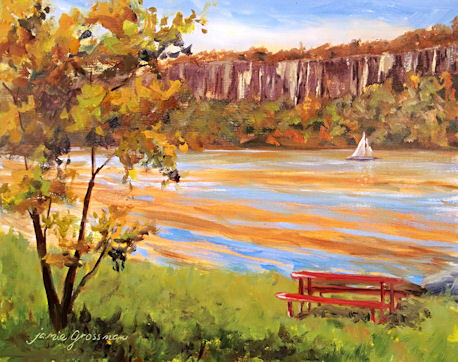 I was telling some visitors to the park that I’d been waiting for a sailboat to go by so I could pop it into the painting. We all looked up and there it was! 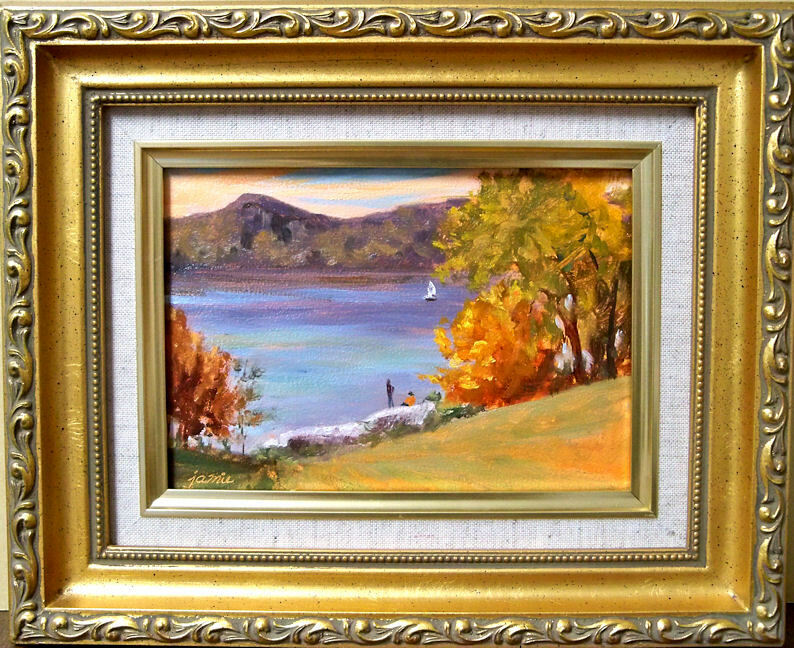 This week I’ve been working on touching up paintings done previously. 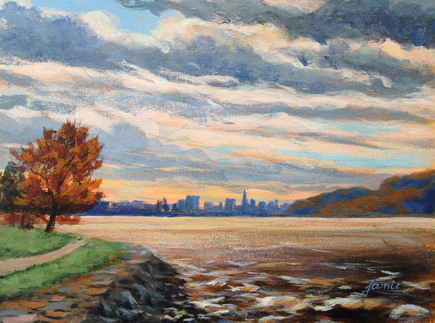 Often I am not 100% happy with a completed painting. I hold off on varnishing those for as long as possible, so that I can make changes to them when I get a chance. There are things I loved about this lighthouse painting, but when I initially painted it on location, it was early April. 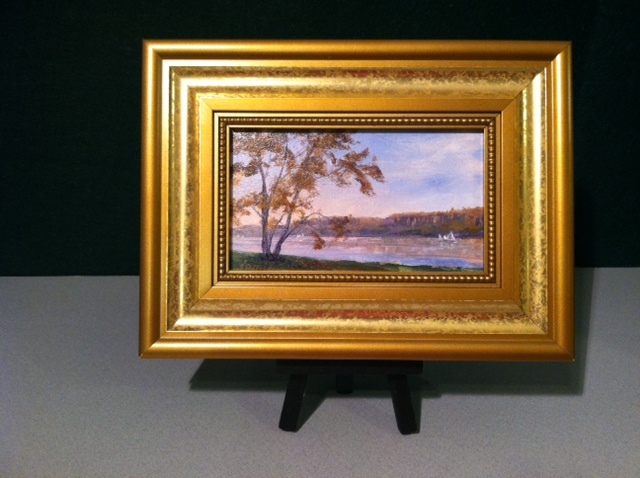 The leaves were not yet out on the trees, and the grass had that dull, late winter color. 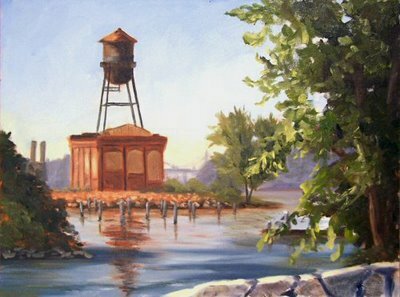 The painting looked way too stark to me, although it was a pretty accurate representation of the scene at the time. I decided to push the season along in my reworking. I’ve left the original below, because I thought it would be interesting to my viewers to see it and compare them. I’m interested in hearing your comments about the changes. 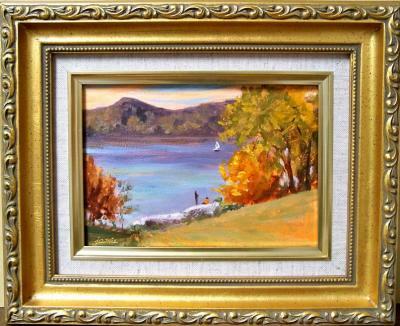 I’ll be posting more of these altered paintings this week, along with their original versions. I hope you find it interesting! If you’ve ever driven over the Tappan Zee Bridge, across the Hudson River, you’ve likely noticed this sparkling lighthouse near the eastern shoreline. 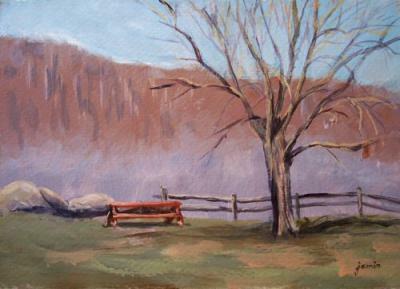 This was painted en plein air on a very cold and windy morning, but I was inspired enough by the view to stick it out and paint. With the New York City skyline in the distance, the Palisades jutting out into the river, and the bridge behind the lighthouse, there was a lot to put into one painting. 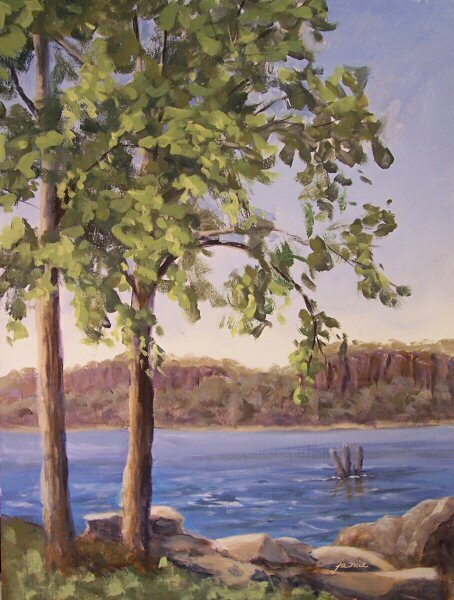 I liked including the foreground tree too, to give yet another dimensional plane to the work. I’m hoping to return many more times as the foliage emerges. Gotta love that red! 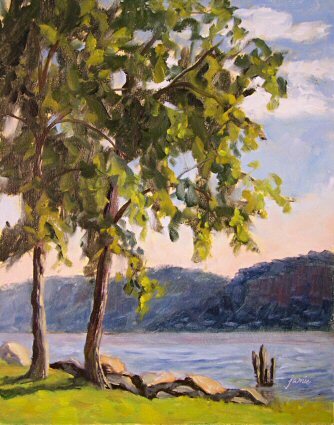 This was painted on location at the beautiful Hastings Waterfront Park on the Hudson River. There were a couple of fishermen there, and one of them was kind enough to pose for me. Thank you, Sean! 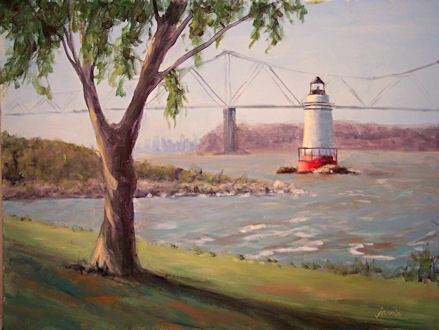 This is a plein air painting that I did awhile back of the famous water tower along the Hudson River at Hastings-on-Hudson. 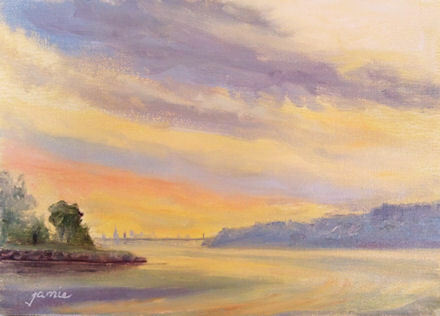 There was a big environmental feud brewing between residents who wanted the tower restored and kept as a local landmark, and the property owner who wanted to avoid the high costs of restoration and just tear it down to build something more lucrative. 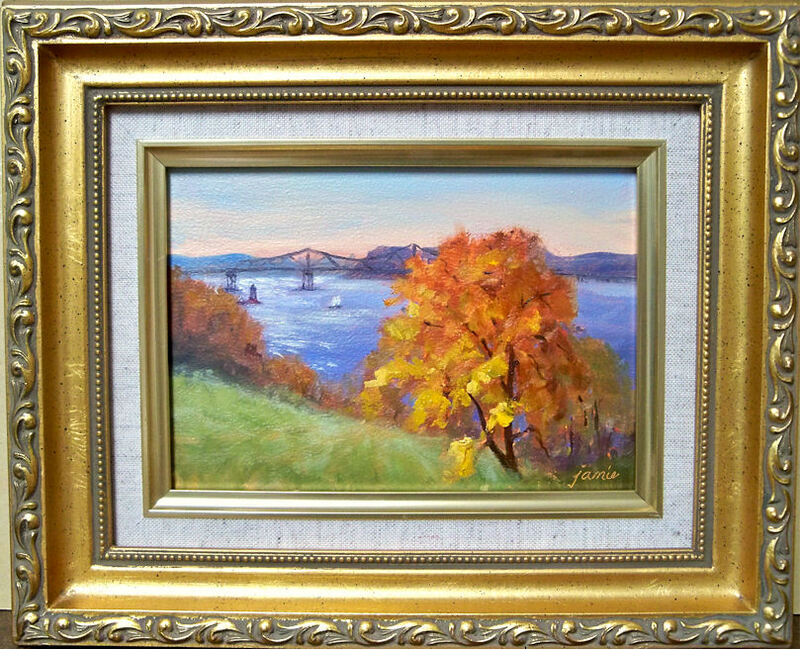 I love the warm colors and interesting shapes, and wanted to be sure I had the opportunity to capture it in paint before it disappeared. I’ll have to check back and find out what the current status is, and whether or not the residents will be able to keep their landmark. 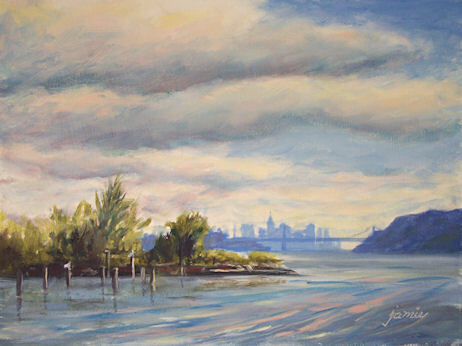 This is another Hudson River painting done this week on location at Hastings Waterfront Park. 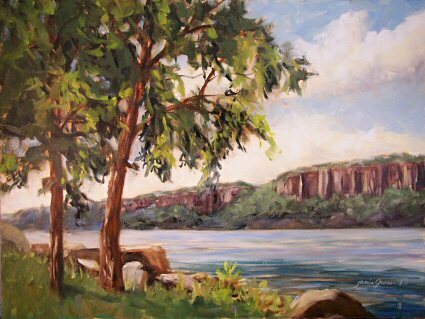 This time, I turned toward the Palisades across the river, with the rocks and trees in the foreground bathed in cool, morning light. This is another plein air painting of the Palisades, painted from the east side of the Hudson River. 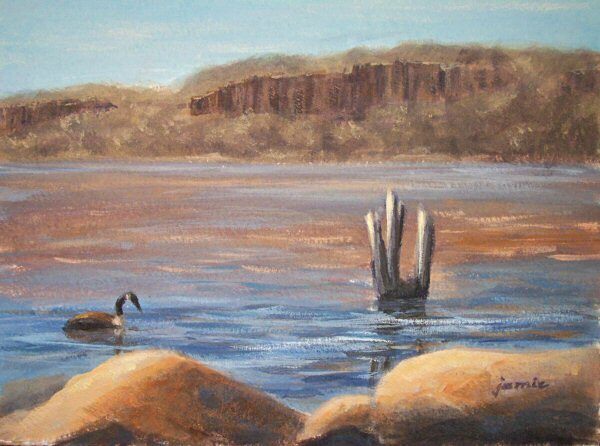 The goose did actually swim right by as I was painting, so I figured he wanted to be included. Pretty soon those trees on the far shoreline will leaf out and everything will be green. It always seems to happen just overnight! 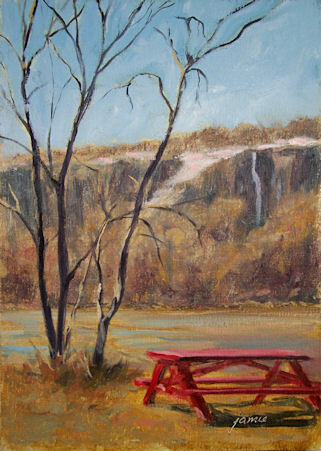 When I arrived at the Hudson Riverfront this morning, it was totally fogged in and I couldn’t see anything but this tree and picnic bench! 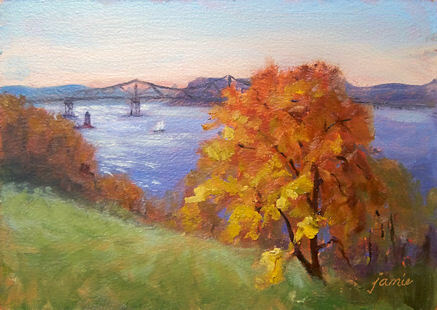 I decided to paint that while waiting for the fog to burn off. 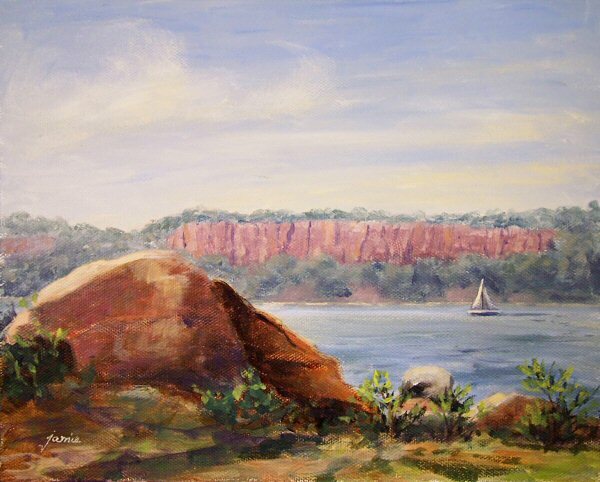 It lifted as I was painting, revealing the striking cliffs of the palisades on the far shore, so I had to put that into the painting!